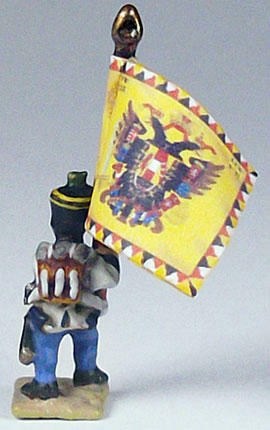 I had a shot at what was my first attempt at sticking one of my new Austrian flags (see Post 136) on a Pendraken figure’s flag pole. 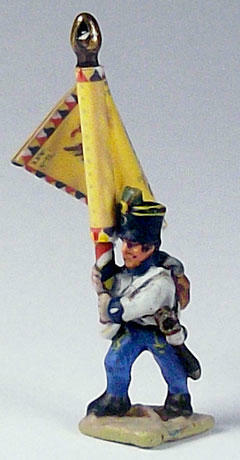 The flag was an 1806 pattern for IR33 with the regiment’s number in the top corners. The photo paper I had used to allow a print resolution of 720dpi although not weighty was on the necessarily thick side and too thick to happily curl around a flag pole so very small. I therefore softened the central fold of the flag with water before applying PVA glue. I was somewhat caught out by the paper sticking solidly on impact. I had been hoping for a little give to allow me to match the sides correctly. Not a terrible result but as a con- sequence I had to trim some edges – but only a hair. The 1809 Blog hit 50,000 visits at the beginning of February, jumping another 10,000 visits since November of last year (see Post 119). 50,000 seemed a significant number, but now after hitting 50,000 I thought it might be time to leave off counting visit numbers for the foreseeable – while still crossing my fingers and hoping that numbers might some day reach an even more significant number. 100,000? I wanted to disguise the edges of the white paper by painting them. The painting I did also helped to hide any mismatched edges. I also had to paint over some parts where the printed surface had rubbed off during gluing – despite a protective coat of varnish – luckily nothing of much detail and perhaps adding a little wear-and-tear to the standard. The paper wasn’t very flexible so it didn’t lend itself to much folding to make it look as if it was blowing freely in the wind. Also, the printed surface appeared quite sensitive to folding.